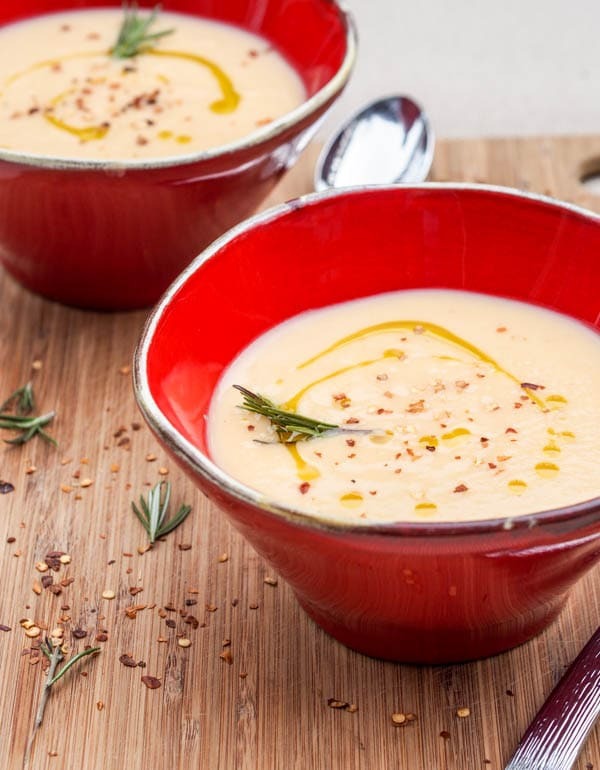 Make a super creamy parsnip soup vegan with sweet potatoes, white wine and coconut milk. Gluten-free too! I need soup in my life right now. It is cold, it is winter time. It is soup overload time. Today I already had two bowls of soup. A sad first showing of miso soup from a packet poured into a hotel room disposable cup and filled with coffee maker heated up water. That didn’t quite hit the spot. Then at dinner in Los Alamos, New Mexico (which is where the atomic bomb was invented – how’s that for a bit of trivia for ya) I had a bowl of vegetarian lentil soup. That was a bit better than the miso, but it was made with brown lentils, and I am so much more a fan of the adorable red lentils (which pair awesomely with apples for a divine soup). What I really wish I had, though, was a hot steaming bowl of creamy parsnip soup. 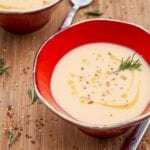 I know, parsnips are not the first ingredient you think of when it comes to a creamy soup, but you’ve got to give this delicious root vegetable a chance. I feel like parsnips are a highly underrated vegetable that you don’t see as the star of a dish too often. I mostly only see parsnip sprinkled around a bag of root vegetable chips. And that’s not ok, because parsnip is a star vegetable and needs to be embraced on it’s own! It does not need to be the backup act all the time. I make roasted veggies all the time with butternut squash, sweet potatoes and parsnips, and seem to find myself gravitating to eating mostly the parsnips out of the bunch. There’s just something earthy and comforting about parsnips. They might currently be my favorite veggies. So why not let those white carrot looking veggies shine on their own as the star of a hot creamy parnsip soup? Are ya with me? This soup does require a bit of prep work since you first have to dice up the parsnips and sweet potatoes and then roast them, but trust me every bit of effort is worth it for this ever so slightly sweet, fragrant and spicy soup. If you have a kitchen assistant (boyfriend, fiance?) have them help you out here to make this process move along faster. Once the veggies are roasted the soup making begins with a bit of onions sauteeing then deglazing to be followed up with a pour of broth and coconut milk. Then add in those fragrant veggies mix, and puree. Your creamy parnsip soup is almost ready! The additional rosemary and crushed red pepper flakes make the soup flavors really pop and the parsnips are ever so slightly sweet and smooth. Serve the creamy parnsip soup drizzled with a bit of high quality olive oil for a finishing touch! Let me know what you think of this soup recipe in the comments below. A super creamy parsnip soup with sweet potatoes, white wine and coconut milk. Both vegan and gluten-free. Preheat oven to 400 degrees F. In a large bowl combine parsnips, sweet potatoes, 2 tablespoons olive oil, rosemary and salt. Toss to coat. Mix. Bake in a single layer on a parchment lined baking sheet for 30 minutes, or until lightly browned and soft. Heat remaining 1 tablespoon olive oil in a pot over medium heat and add onion. Cook for a couple minutes until lightly browned. Add white wine and let the mixture bubble up for a couple minutes. Add broth, bring to a boil. Cook for 1-2 minutes. Add coconut milk, salt to taste and crushed red pepper flakes. Bring to a boil. Add squash and sweet potatoes to the pot. Cook for a couple minutes. Remove from heat and puree with an immersion blender, food processor or blender. Garnish with extra rosemary, swirl of olive oil and pinch of crushed red pepper flakes. It’s definitely soup time of year and this sounds lovely. I only recently started eating sweet potato as I remember hating it as a child. Thankfully my taste buds have changed! I too love roasted veggies, but this sounds so creamy. Does it taste sweet? I’m thinking about the parsnips and sweet potatoes with the coconut milk. Thanks for the recipe. The recipe doesn’t taste too sweet, more creamy with the tiniest bit of a sweet undertone. Definitely glad I’ve finally changed my tune and given sweet potatoes another chance! This is delicious I tried it today, easy to make and really belly- and heartwarming so to say. Next time I will just leave the vegetables a bit longer in the oven to get them a bit more “roasted”. Thank you very much for this great recipe, I do enjoy receiving your newsletter and all the inspiration. Love that your recipe calls for coconut milk! What a nice addition! Thanks! I love adding coconut milk to recipes and think it gives them that perfect creamy consistency. This soup looks so delicious! I love parsnips and have not tried in a soup, so I am looking forward to it. I loooved the taste of this soup as I had never tried a creamy pasnip soup before and I find parnsips have their own very specific flavor that worked really well in a soup! Made this tonight and it was lovely! Just the right level of spice and fragrant taste from the chilli flakes and coconut milk. I had more sweet potatoes than parsnips in the cupboard so mine was a little more orange! But it worked for me. I also liked how thin it was, whereas I usually have thicker soups. Yum yum yum. So easy to make too. So glad you enjoyed this! Thanks for taking the time to comment and let me know! OMG! Fantastic! I had a hankering for parsnips, but thought what I’m gonna do about it?! Luckily I had all the ingredients for this on hand! Except the dry white whine, but I just got my bicycle fixed so I took it for a spin to the store. Totally worth it! the wine makes it.! DELICIOUS! Thank you so much! Lovely soup, if you have medium sized parsnips and sweet potatoes then add a few more of each. I put in the whole can of coconut milk and a couple teaspoons of black pepper, a tbs of vegan butter and a dash more chilli flakes. Happy to hear you enjoyed the soup!